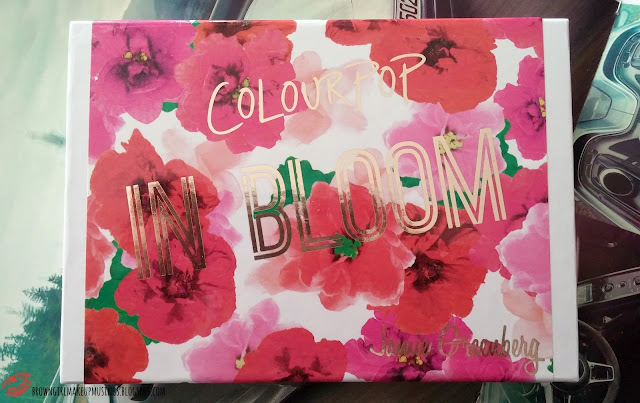 The ColourPop In Bloom set is a collaboration between ColourPop and makeup artist Jaime Greenburg. 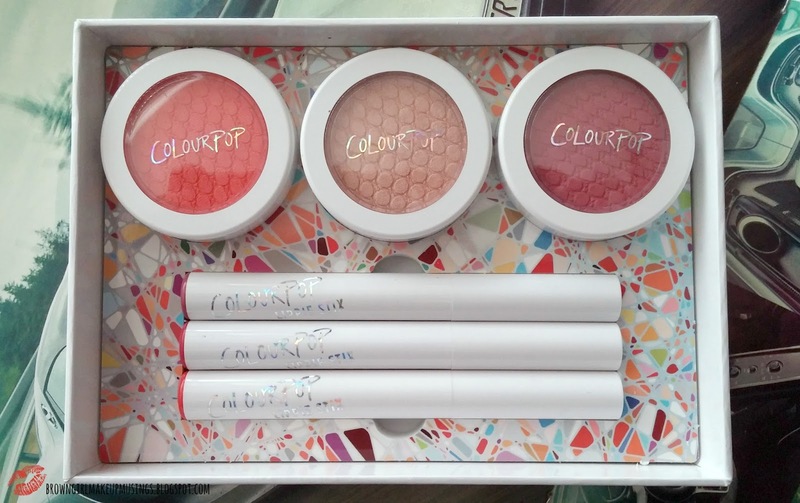 It features three cheek products (two blushes and a highlighter) and three lipsticks ("lippie stix"). I wanted to review this set as soon as I could, while it was still available, so you can decide whether or not you want it! (Spoiler alert - you do). 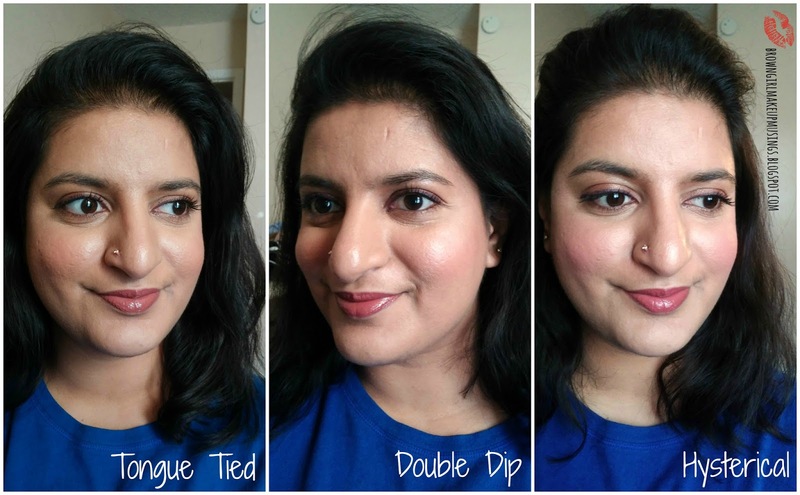 In this post I'm talking about the cheek products, and I'll be reviewing the lipsticks on Friday's post. The packaging for the brushes is quintessential ColourPop - white, round, plastic packaging with the company name in holographic print. It's a screw-type jar, and has to be kept tightly closed when not in use to prevent the product from drying out. The In Bloom set cheek products are all limited edition and are unavailable for individual purchase. The set comes with three of their Super Shock Cheek products in Tongue Tied, Double Dip and Hysterical. 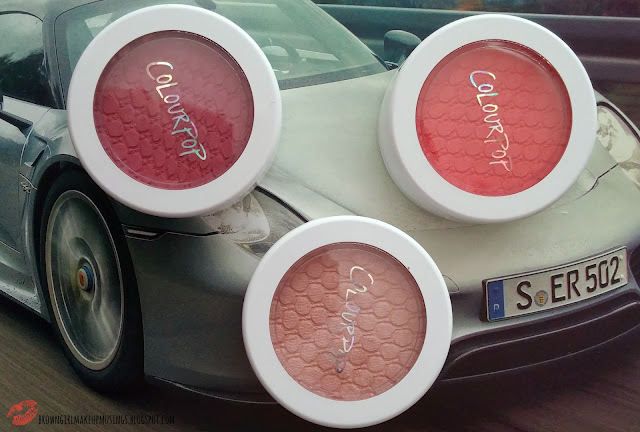 All three are the signature Colourpop mousse-y cream-to-powder texture. Hysterical is a cool-toned, slightly plummy pink blush. It has a matte finish. It's easy to apply and spread - I used a dual fibre stippling brush to apply this, and it picked up and applied the product well. If you want a more pigmented application, it's best to use fingers. 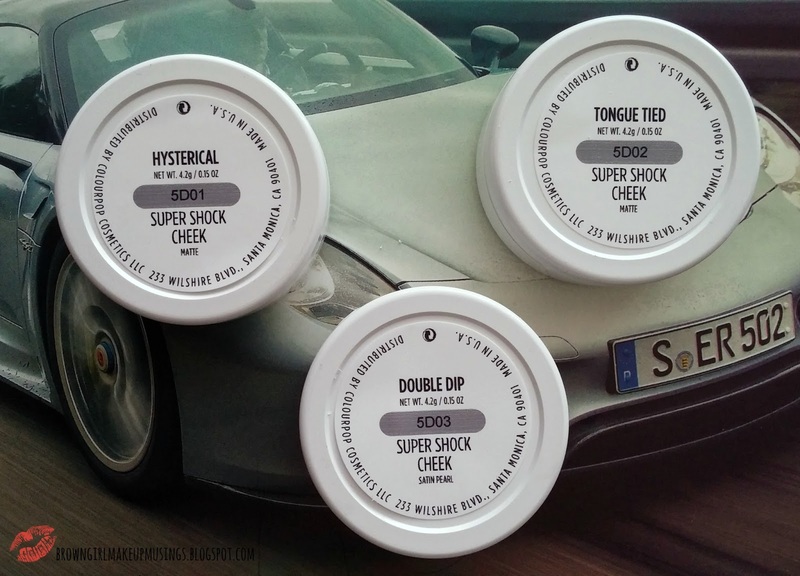 Double Dip is classified as a Super Shock Cheek but in my opinion this will be a highlight on most skintones. It's a light champange gold with a rose tone to it, and is absolutely gorgeous. It's got a satin finish, and is very subtle. This has definitely become one of my favorite highlighters, if not the favorite, because the finish is very friendly on both my oily skin as well as my large pores. I tried applying this with a stipple brush, and it gave me a subtle glow. However for in the picture below I applied using my finger to get the product to show up enough to photograph it. It's my sincere hope that ColourPop will make this a permanent addition to their line! Tongue Tied is a reddish-coral blush with a matte finish. I found this slightly easier to apply and blend out than Hysterical, I used a dual fibre stippling brush to apply this, and it went onto my cheeks easily and blended out with no issues. Again, if you want a more pigmented application it's best to use fingers. All three products will work well for all skintones. 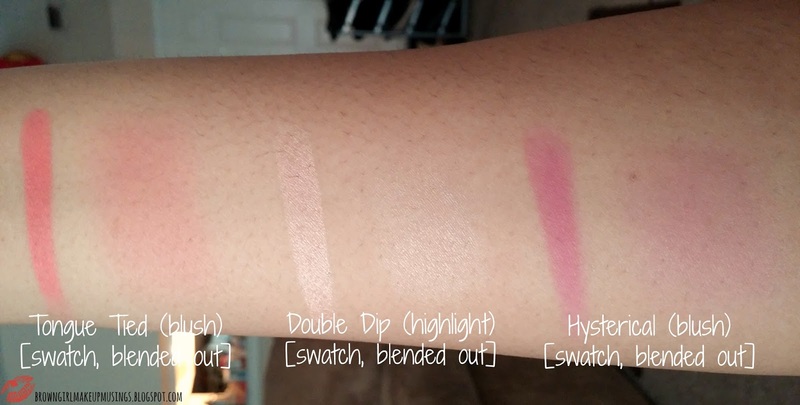 The blushes are extremely pigmented but can be sheered out, depending on what you use to apply them. The pigmentation can also be built up easily on the cheeks. The shades are also ones that will suit most people. At first I thought they were fairly standard colors, but something about them makes them a little bit different. The formula is fantastic for oily skins - it lasted a good 7 hours on me which is almost unheard of. 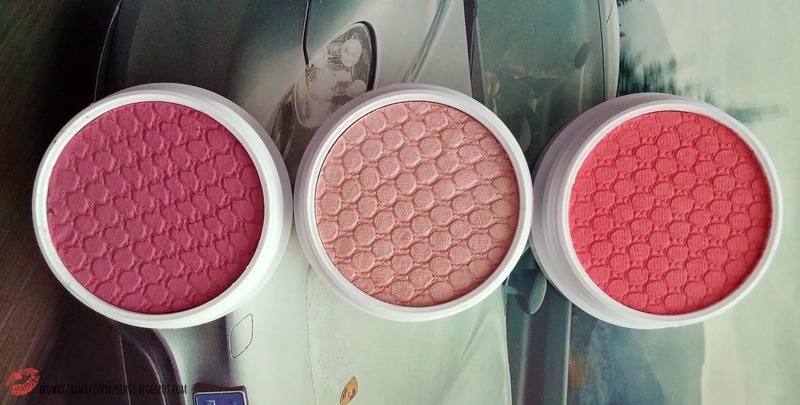 It rivals my feeling for Chanel's cream blushes, which are my favorite cream blushes. Despite being a matte finish they really perk up your face and make you look more alive. Given the fact that they're so pigmented, and how long they last, I'd happily pay the price of the set ($39) for these three alone! I'm not a huge fan of telling people "you need this" but if you're in the market for long-lasting, pigmented, matte blushes (and a lovely highlighter) with some (spoiler alert) nice lipsticks, all suitable for spring and summer, well, then, you might want to take a look at this set. OMG I need this set! its stunning..loved all three of them! but i find their shipping extremely slow :( I placed my first order over a week ago and still its not shipped! did you face the same prob? It takes about a week for them to ship, but I get it in 2-3 days! If it's been longer than a week I'd contact them. WHY ARE YOU DOING THIS TO ME?!?!?! They look wonderful on you! Awww, haha. They are lovely! Tongue Tied is totally my kind of color. Such a summery and happy shade! It makes you look naturally radiant, love it. the set is so gorgeous...im definitely ordering some stuff from them! Oh yay! What are you planning to get?